It is well known that men have a harder time deciding to go to the doctor and to see a therapist. I believe that the main reason is that we are taught to be self-reliant, a bit heroic and take care of others, so we avoid doing it until we clearly can’t possibly handle it anymore. I also think it is because the field has focused so much on how some traditional forms of masculinity can be constrictive, that it has neglected, until recently, the amazing traits that non-constrictive masculinities contribute across different cultures. This neglect of positive masculinities might make men to feel criticized for their values when they go to counselling. Counselling that is based on deficits rather than strengths can feel very alienating, and the media stereotypes don’t do counselling professionals like me any favors. Images of emasculating providers can feel confusing, unfair, and unbalanced, especially when a man is trying their best to be a “good camper” and might need help from a counsellor. The good news is that an emerging current in positive psychology is looking at how to overcome this imbalance and provide men with access to therapists that embrace men’s strengths as useful and positive in building wellbeing, supporting gender equity and positively contributing to society. I like to work within these emerging modalities because I believe that we need to balance and be more accurate in the way we look at men’s contributions. The reparative focus on feminism has put the lens on the way patriarchy has negatively affected both men and women. The effort was well justified to overcome inequities, yet it took our awareness away from the many positive ways in which men are socialized. It is necessary to re-appraise some of these ways. Men have also been negatively affected by patriarchy because it constrains the expression of positive masculinities, especially our wish to be nurturing fathers, providers, loving partners and contributors to society. We need to give men a chance to learn how to wield the positive masculine traits and redeploy them in more equitable ways. As a matter of fact, working to help others and helping society are masculine values that I embrace with my work. As a psychotherapist, I feel the need to be inclusive and supportive of constructive models of masculinity. Positive psychology offers a way to do that. Positive Psychology is an emerging modality that balances psychology’s past focus on correcting negative concerns, and “fixing” people. It guides efforts toward building what is right and necessary, using existing strengths as the foundation of the work. Recent research in this modality is looking at how to serve men better by learning to positively appreciate the traditional roles in which men are socialized while avoiding the more constrictive currents. Kiselica, Englar-Carlson and their colleagues have written a few articles identifying some of these roles. As we use positive psychology to build on existing strengths, let’s take a look at some of these positive traits that men are socialized with that can be harnessed in counselling to build better lives. These are representative and also not necessarily exclusive to men. One such trait is that men’s relational style tends to be in groups and engaging in high action. Men tend to enjoy high action instrumental activities in groups to develop friendship and intimacy with each other, such as sports or getting together to do something for others. Women enjoy groups too and tend to favor dyadic relationships more. Men are raised with the expectation they must protect other members of their family and their friends. They also tend to be socialized to act upon other people’s perceived needs. This is expressed in participation in group-oriented activities that have positive societal impact. Some of these can be banding together to participate in athletic groups, philanthropic organizations, work crews, and socially minded gatherings that give men a sense of purpose and community. Some of these male groups include fraternal organizations that have humanitarian service and community building goals. I wonder whether group therapy might not be better for men, considering what I just wrote. At the same time, men tend to be socialized to seek self-reliance by developing resourcefulness and courage. This may be an ingredient in why men tend to wait too long before seeking therapy or medical advice, because they are socialized to fend for themselves. However, men are expected to help out when others need it, so accepting someone’s help can be considered the other side of that coin. A good example is when men stop to help others on the highway. Can getting counseling be considered metaphorically as the same as accepting help changing a tire? Men are expected to go out in the world and do things as a “worker.” Having a job that can fulfill the expected role of being a worker and a productive member of society can also contribute to a man’s sense of positive masculinity. Also, men can be generous and thoughtful providers to their families and loved ones. Many men derive a positive sense of identity from the provider role, including valuable self-esteem, purpose and meaning. When a man has conflicts or problems at work, the pressure to be a provider may compound the problem by encouraging the feeling they have to stick around even though the situation might be untenable. Women feel this pressure too! Positive parenting is something that many men relish as well. A man can be a very positive parent, responding readily and consistently to his child’s developmental needs over time. Men do this with the goal of guiding the next generation to enjoying a better life, often showing involvement that balances guidance and independence, and cultivating the self-reliance mentioned above. Many times, men struggle with balancing a perceived sense of obligation to provide, be successful or have a good job with this desire to be a positive presence in his loved ones’ lives. This is also reinforced by the cultivation of heroic and courageous traits in men. Men have traditionally taken on societal roles where they have to take risks to do certain dangerous but necessary tasks, protect others, and negotiate danger. This includes the idea that a man might need to go through extraordinary efforts such as heroic actions to contribute to society and to demonstrate exceptional nobility of character. Of course, this is not the purview of men only, but teaching men to distinguish between worthwhile and reckless risks has been a way in which masculinity is socialized. While heroic stance can be a positive trait in certain situations, many times men paradoxically wait too long to take action to help themselves. It is not unusual for a partner or spouse to finally bring up the problem and help the individual seek the help they need. I suspect many men feel they might appear as lacking self-reliance if they accept that they might need the services of a counselling provider. In therapy, stigma also contributes to the misunderstanding that only very sick individuals need the help. It is true that very sick people benefit from counselling, but the range of conditions where counselling is useful is rather broad. I think of counselling for people that are not severely ill as a form of consulting, where the beneficiary learns to incorporate insight, self-awareness and new skills as tools to better engage life. Thinking of going to see a provider as self-reliance may be a way to change many men’s way to look at self-care. Like the parent that needs to place the plane’s oxygen mask on their own face before tending to their child, helping oneself is a pre-requisite for helping others and being present in one’s best possible condition. A man that wants to be there for his loved ones, to be in good shape to sustain good work, and help others, may want to embrace radical self-care as a form of self-reliance and using the best tools to stay in shape and be there for others, and to live a long and fruitful life. 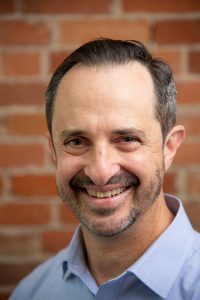 Ariel Blau has a formidable passion for helping his clients energize a joyful, loving and creative life. He has more than 30 years of experience helping people bloom. His formal education includes a Master’s degree in Social Work from New York University, a Master’s in Fine Arts from Brandeis University, and a great number of workshops, certificates and seminars. He has been studying mindfulness and how to bring compassion into the world for more than 15 years. His passion for helping others is matched by his enormous drive for continuous learning. 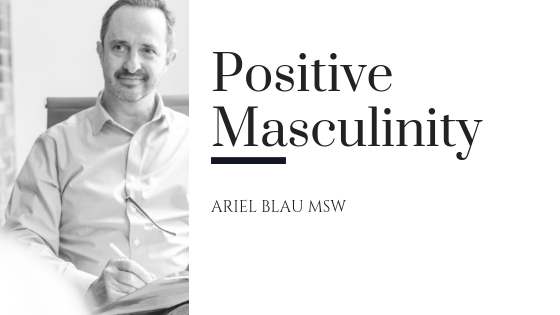 Ariel completed his professional clinical training at Yale New Haven Psychiatric Hospital, and served as Lead Clinician at the Jewish Family Service of Greater New Haven. Ariel Blau brings a sense of active engagement, innovation, and imagination to his work as a catalyst for change, responding to the idea that every person’s life is a work in progress. He wakes every morning eager to do what he loves, full of energy and enthusiasm.